Aidan, Matthew and Andrew Young say that the hobby has helped change their lives. In a small, top-floor room on a rainy November evening, three brothers have arrived early for class and are meticulously practising their steps. 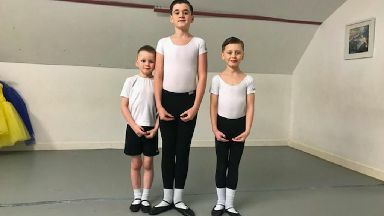 Aidan, Matthew and Andrew Young, from Aberdeen, love dancing, and it's through this joy of ballet that they're really starting to find their feet. Aidan, 11, and nine-year-old Matthew are on the autistic spectrum, while Andrew, seven, has ADHD. Despite only taking up dancing recently, their mother says it has changed their lives. "It's wonderful. The boys are happy, they're more sociable, they're engaging with friends," explains Catriona Young. "We didn't think that was going to happen, so for us as a family it's huge. "School's been really difficult for the boys, but dancing really brings them out of their shells." "School's been really difficult for the boys, but dancing really brings them out of their shells. "You see them smile and as a family we can now do things that we were never really able to do before. That's important." 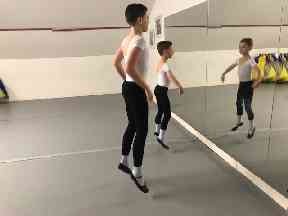 Matthew was the first to be bitten by the dancing bug, asking his mum for ballet lessons after becoming transfixed by the animated film Ballerina. "I like ballet, it makes me feel happy and I've got friends here," Matthew says. It wasn't long before Matthew's brothers also signed up for classes at the Aberdeen Academy of Performing Arts. "I really enjoy dancing and meeting people here, they're all really nice," adds Aidan. "I just like being here." Andrew quips: "My favourite are all the leaps that you can do." The brothers are currently rehearsing for the Academy's production of Swan Lake, which is being performed at Aberdeen's Tivoli Theatre on Sunday. "They've just fitted in so well to the class, it's been fabulous," says dance teacher Rachel Young. "Dancing gives them a sense of belonging and confidence. There are no labels, no special treatment. "This place is an outlet for them to have fun and express themselves. It's a safe zone. "They've definitely made friends for life here." Matthew now has ambitions of becoming a professional dancer. His mother says she hopes the story of her three boys will encourage other parents whose children may be struggling to consider the benefits of dancing. "Definitely try it, would be my advice," she says. "My boys have been welcomed here with open arms. It's a special, magical thing."